Danielle over at Well, That's Just Fabulous! 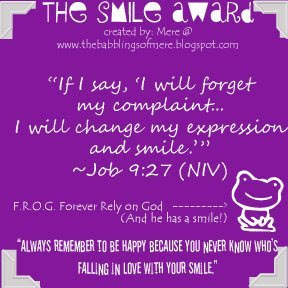 nominated me for the smile award! It was so nice to read her sweet comments and I really appreciate it. She is a truly fabulous person and it's too bad we live on the opposite sides of the country because I'd really like to hang out with her and see her smile in person! 4. You must fit the characteristics of the recipient of the award, as posted by Mere. 7. You must thank your giver. 1. Must display a cheerful attitude. 4. Must learn from others. 1. My fab friend Candace. We always laugh within the first minute of communication or contact with each other! She's a great mom to two wonderful kids and hopefully one day we'll live in the same state again! We've traveled through the adoption journey together, hers lead her to Shepherd and mine, well we'll see one day! We've already begun discussions of 'pre-arranged' marriage for Shepherd and Molly. I don't think they'll mind, do you? 2. Kim over at 3 Peanuts probably has received this award before...and who doesn't love her and her fabulous taste?? But I just couldn't leave her out because I check on her and the peanuts almost daily and she's sure to bring a smile to my face with her words, advice, decorations, or adorable kids' pictures! She's inspiring on many levels, but most recently in her brave move to a strange new city. 3. Suzanne at Steece's Pieces is adorable and always brings a smile to my face. She's amazing with those 4 kiddos!! He husband and her share a very fun relationship and I think they are smiling a lot in their home! 4. Jen at 4tunate seems to make me smile with her honesty and humor at her daily life with 4 kiddos as well! Her husband and her also seem to work hard together (and laugh a lot!) in order to make in through the days with the stress that multiples bring! 5. Finally, Mimi at It's not all Flowers and Sausages (shout out to teachers who rock!) makes me laugh out loud with her teacher stories which I can relate to on most every level! She is a totally fantastic teacher and she inspires me to be a better one. So thanks girls for making me smile!! Thanks for making me smile already on a Monday morning! Your words were an encouragement to me. Your blog is beautiful and I look forward to reading more about the little girl who has been chosen just for you in China. Thank you so much...I'm smiling...and it's MONDAY!!! Thank you for making me smile through a difficult time. I only have a minute (in a hotel lobby) but THNAK YOU!!!! I so appreciate this (and I had not received it) and I will post about it once we get home and settle in again.